Economic Values | Ich bin ein Sender. Ich strahle aus! | I am a sender. I transmit! In the mid-1970s, Beuys began a range of projects that explored the concept of economic value, whose scope he attempted to enlarge. 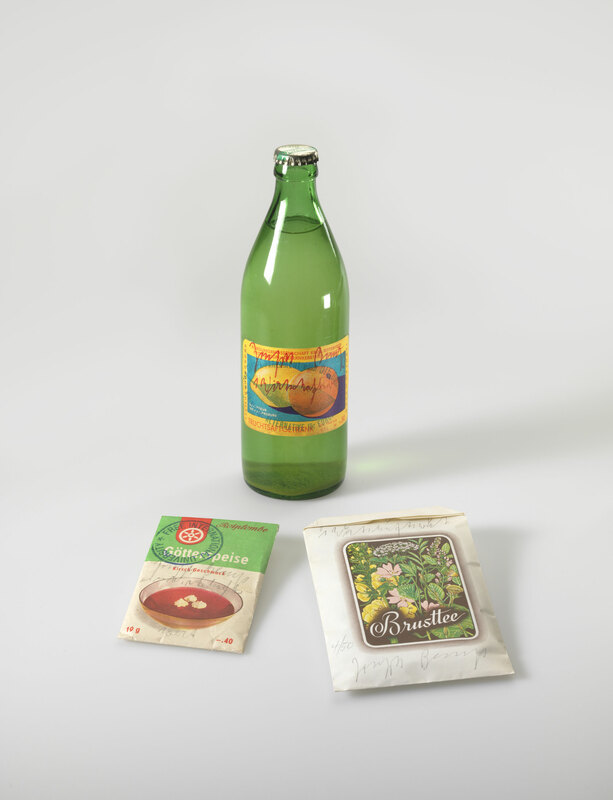 Above all, the installation with this name from 1980 became famous: it presented typical packaged food on simple iron shelves as it was once sold in stores in the former German Democratic Republic: flour, margarine, bottled beer, sugar, malt coffee substitute. The sparsely packed, poorly lit shelves functioned as the counter-image to the oversupply of Western supermarkets, and criticised the disrespect encountered there for the resources indispensable for life, among which Beuys included human creativity. 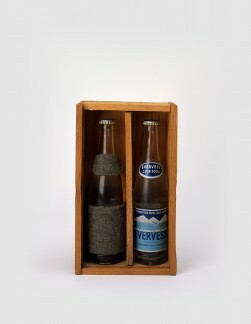 Like most of the Economic Values, the four works shown here consist of food products, whose packaging Beuys stamped and inscribed before releasing them as multiples or unique artworks. Together, they foreground the different kinds of value with which he invested such items. 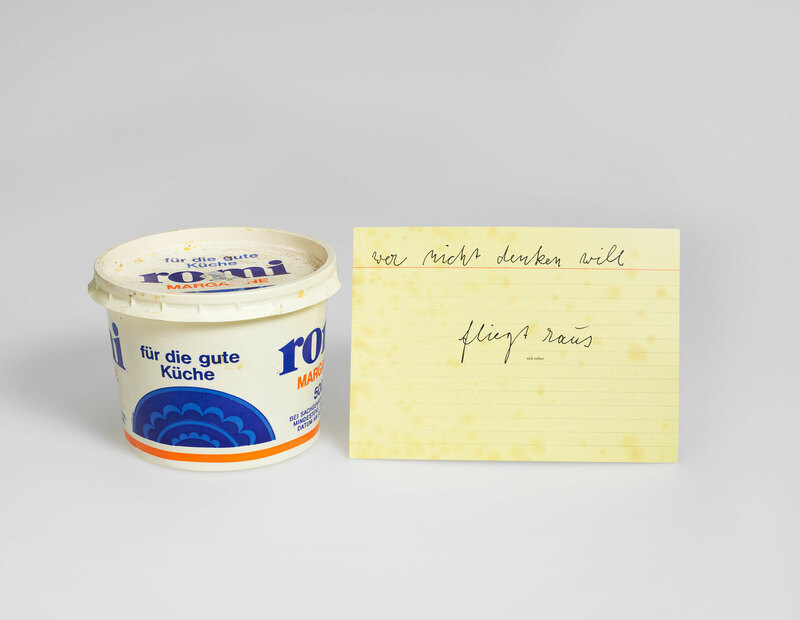 All four products, for example, affirm Beuys’s interest in food as a source of spiritual as well as physical nourishment. As with many of the substances he used in his art, Beuys saw food as a bearer of warm energy, the force he regarded as the basis of life and the well-spring of all creativity.1 To eat was thus to assimilate this energy. 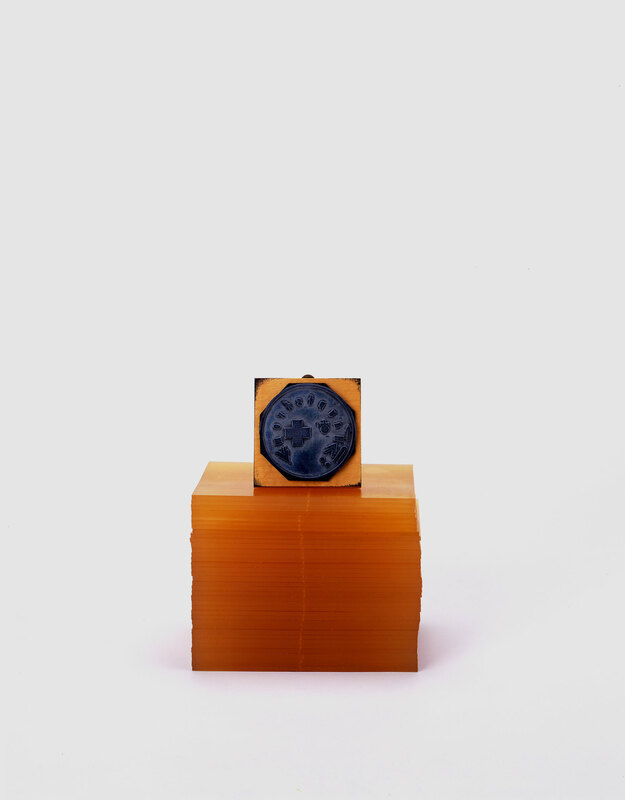 One of the works shown here is called Economic Value APOLLO, a name that refers directly to warmth through its evocation of the Greek god of the sun.2 The product of which it consists is a tub of margarine—a warmth-bearing substance that Beuys employed often in his art. Also depicted are a bottle of fruit juice and a packet of jello—foods containing sugars that spread warmth throughout the body as they metabolise. Beuys valued the medicinal properties of many foods. Economic Value Breast Tea, for example, consists of a packet of lavender tea. Like many of the herbs with which he worked, lavender is a plant that has long been consumed for its soothing effects—a capacity alluded to in this work’s title, which suggests that the tea might bring relief to a chest ailment. 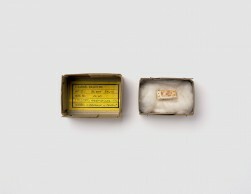 By encouraging awareness of the beneficial qualities of food, Beuys sought to foster a more thoughtful approach to consumption, at a time when the growth of marketing and processed foods was eroding knowledge of the contents of many products. As if to warn against the dangers of this development, a postcard included with Economic Value APOLLO baldly states: ‘whoever refuses to think gets kicked out’ [wer nicht denken will fliegt raus].